Where have fleeing IS fighters gone? Mr Stewart's comments contrast with the independent reviewer of terrorism legislation, who recently told the BBC that Britons who join IS through "naivety" should be spared prosecution if they return home. When the question of rehabilitation was put to Mr Stewart on the BBC Asian Network, he said that his original comments referred to fighters still on the ground in Syria and Iraq. "If they came back to the UK they need to be arrested and tried in accordance with normal British law," he said. "And then you need to work with them as you work with anyone else." A government spokesman said Mr Stewart's remarks were consistent with the position set out by Defence Secretary Sir Michael Fallon on 12 October. Sir Michael said British IS fighters in Syria and Iraq had made themselves "a legitimate target" who could end up on "the wrong end of an RAF or USAF missile". 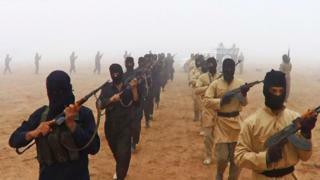 The head of MI5 revealed this month that more than 130 Britons who travelled to Iraq and Syria to fight with the terror group have died. Mr Stewart also said British authorities had made it "very clear" that people should not be volunteering with militia groups to fight against IS.